Amoeba Music is renowned for its record collections. Marc Weinstein and David Prinz own the largest collection of records in the United States, and as co-owners of Amoeba Music, they have the "biggest and most complete record store in the world," Weinstein said - an achievement that made it the best record store in America, according to Rolling Stone magazine. After meeting in San Francisco in the 1980s, Weinstein and Prinz, a drummer and a guitarist, respectively, decided to make their shared love for music - which Weinstein called "a great commodity that means something spiritually" - tangible to others. 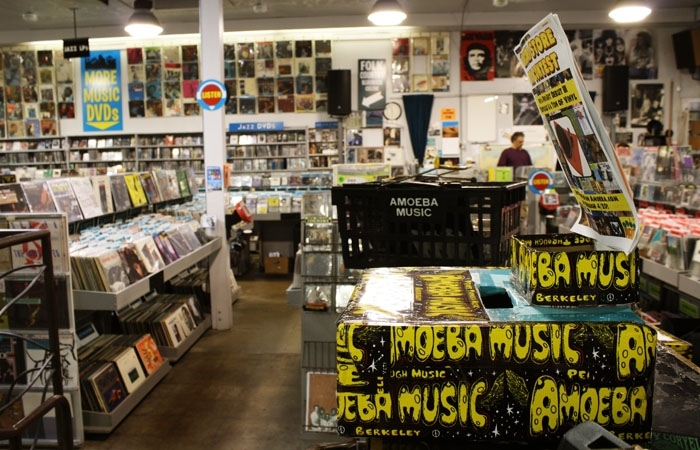 With money from the sale of Prinz's video store and a few loans, Amoeba Music was "started from scratch" on Telegraph Avenue in 1989 with an inventory of 6,000 records. Since then, the store's inventory has expanded drastically and now, all three locations - Berkeley, San Francisco and Los Angeles - carry over 100,000 pieces. The Berkeley store keeps its inventory varied and consistently well-stocked, sometimes purchasing over 1,000 new and used records a day. Weinstein said that between its three locations in California, Amoeba acquires more than 5,000 pieces daily from private collections, out-of-state sellers and walk-ins at the store's "buy counter." He added that in his 21 years of co-owning the stores, he has seen many trends in local and regional economic climates as well as in consumer preferences. At the beginning of the recession, Weinstein said the Berkeley location experienced "a very dramatic decline" in sales, followed by a moderate decrease in San Francisco and no decline in Los Angeles. "The city has done little, if anything, to bring the avenue back up," he said of factors contributing to the all-around poor sales on Telegraph. The introduction of digital mp3 music that enabled customers to buy records online has had both a positive and negative effect on his stores. In a move to broaden its consumer base and appeal to those who prefer digital media files, Weinstein said he hopes to launch an online store for sometime in mid-2011. The store, which he said will be the last, will sell records, CDs and mp3 files. Many customers continue to shop at Amoeba despite the availability of music online, which Weinstein attributes to customers who still want the greater "listening experience" of CDs and LPs. Another factor that distinguishes Amoeba Music is the staff's love for and knowledge of music. Weinstein said the Berkeley store has many veteran staff members, whose ability to answer questions and converse fluently about music is an attractive feature that draws customers to the store. "We always champion great independent artists who don't have the big media machines behind them - most record stores just put an A, B, C, D," Weinstein said of the label cards that identify and categorize artists in the store's records bins. "We give them their own bin cards, giving independent artists their own equal chance." Jim Brady, an Amoeba customer who has been shopping at the Berkeley store since it opened, said he comes in about once a week to look for new arrivals to add to his collection. Weinstein said it is an honor to be named the nation's number one record store, but he said Amoeba has always been widely recognized as the best. "We had Paul McCartney come in with his wife and his kids," he said of the Los Angeles location. "He was just hanging out at the record store." Jessica Gillotte is the lead business reporter.